October 28, 2016, 12:27 p.m. There is a dispute festering at the heart of the crisp world. The staple of lunchboxes and pubs across the land is subject to a decades-long conflict that is dividing the nation – which flavour should green packaging represent: cheese and onion or salt and vinegar? In this regard, Walkers is the anomaly of the crisp world. With Walkers salt and vinegar crisps coming in green packaging and cheese and onion in blue, they stand counter to the majority of other crisp manufacturers – most notably Golden Wonder, the former market leader. So strong are people’s feelings about what colour packaging crisp flavours should have that Walkers were forced to release a statement to customers convinced that the colours used to be other way round denying that they had ever been different. This matters. Research carried out by Charles Spence, professor of experimental psychology at University of Oxford – originally reported in the Daily Mail – found the wrapper colours for crisps can affect the product’s taste, saying “Many subjects will taste the colour of the crisp packet, not the crisp itself”. So what colours do the public think that crisp packets should be? A YouGov survey in 2014 found that cheese and onion was the UK’s favourite crisp flavour, at 31%. The flavour seems to be the flagship Walkers crisp – if you ever watch the Walkers TV adverts, Gary Lineker is almost always eating from a cheese and onion packet (unless promoting another flavour specifically), despite the fact that Lineker’s favourite flavour is salt and vinegar. Walkers actually has the pedigree for cheese and onion, introducing the flavour in 1954, a full eight years before Golden Wonder followed suit in 1962. 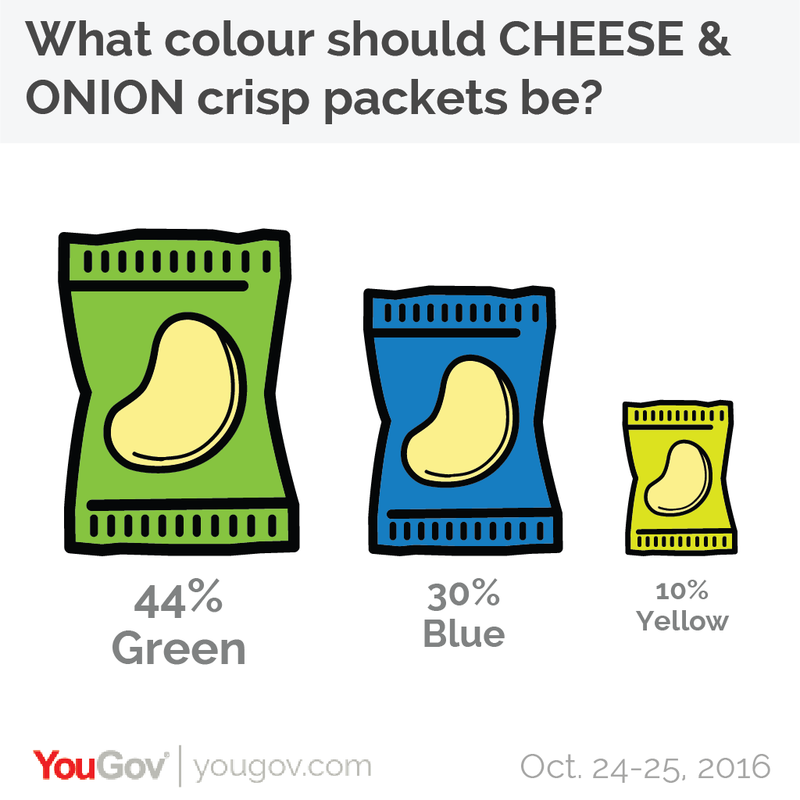 Despite this, the public view runs counter to the Walkers colour scheme, with 44% saying the cheese and onion colour should be green, whilst 30% say it should be blue. A further 10% say it should be yellow, which some of the gourmet crisp companies currently use (and, admittedly, makes thematically more sense when you think about it). Likewise, for salt and vinegar Walkers finds itself running colours counter to public perception. 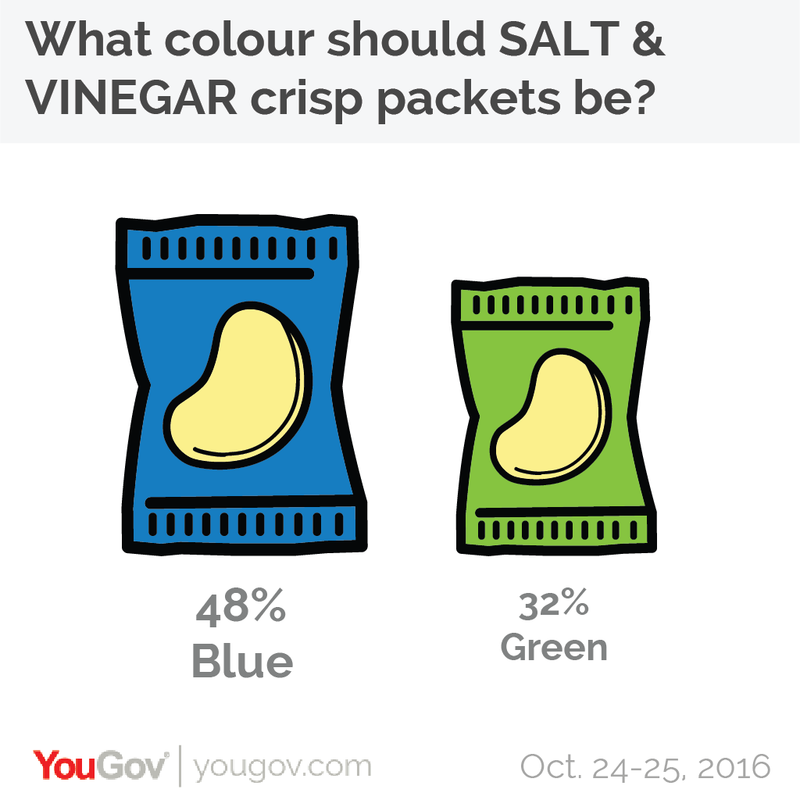 Nearly half of people (48%) say that the salt and vinegar crisp colour should be blue, whilst 32% say that green is the right colour. Walkers is on the right side of the public when it comes to ready salted crisps though. 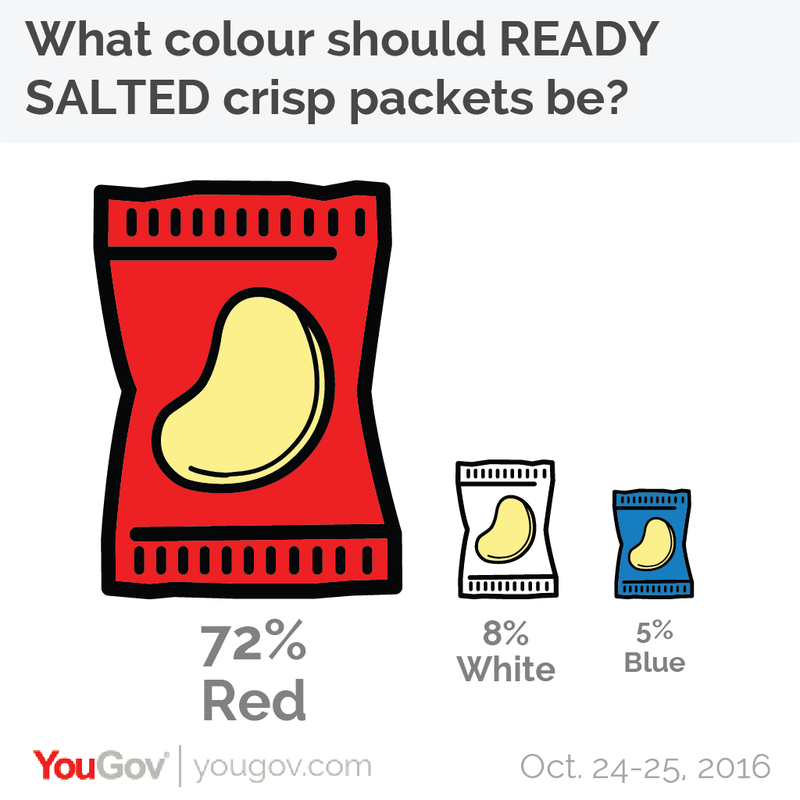 An overwhelming 72% of people said that red was the appropriate colour for ready salted. 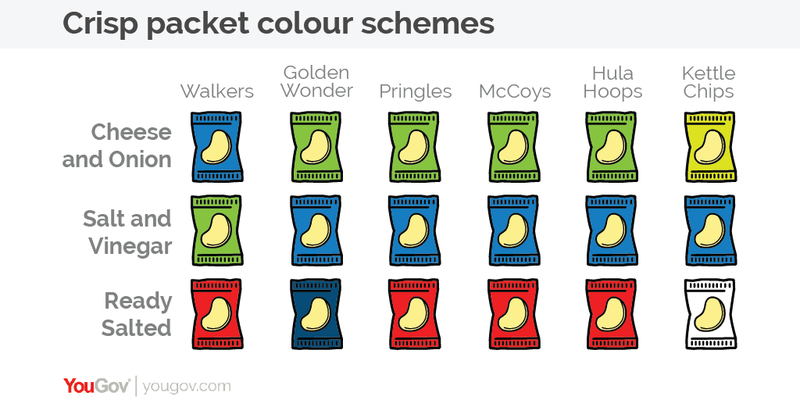 This is far less surprising, as many other crisp manufacturers use red for this flavour too – in fact Golden Wonder is the outlier here, using a darker shade of blue for ready salted packets. Additionally, there is near-universal public agreement on prawn cocktail and beef flavours, with 79% saying that the pink and brown should be the packaging colours for these flavours respectively. Age is a key factor in the crisp packet colour choice. Golden Wonder used to dominate the crisp market, whereas Walkers gained prominence in the 1990s after being bought by PepsiCo – Gary Lineker’s first advert with Walkers was in 1995. This helps to explain why, alone among the age groups, 18-24 year olds are more likely to support the Walkers colour scheme than the Golden Wonder one. For instance, whilst the population overall thinks cheese and onion crisps should be green over blue by 44% to 30%, among 18-24 year olds these figures are 26% and 54% respectively. Older people also have some distinct preferences. For instance, whilst 8% of the population think ready salted crisp packets should be white, this rises to 14% for those over the age of 65 – potentially a throwback to the colouring of the Smith’s salt and shake packets. Likewise, almost a quarter (23%) of older people think that cheese and onion crisps should be in yellow packaging, compared to 10% of Brits as a whole. Scotland and the Midlands also seem to have their own distinct crisp cultures. Scots are significantly more likely to back the Golden Wonder colour scheme – 71% think salt and vinegar packaging should be blue and 67% think cheese and onion should be green, compared to 48% and 44% for Britain as a whole. They are also the most likely to think that ready salted should be blue (12%). The Midlands on the other hand backs the Walkers colour scheme – the only region to do so. This is likely because Walkers is a Midlands company, founded in Leicester in 1948, and was still primarily a regional brand as late as the 1980s.